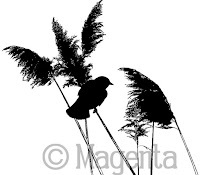 Hi everyone, I'm over at the Magenta Blog today and you can see that post here. 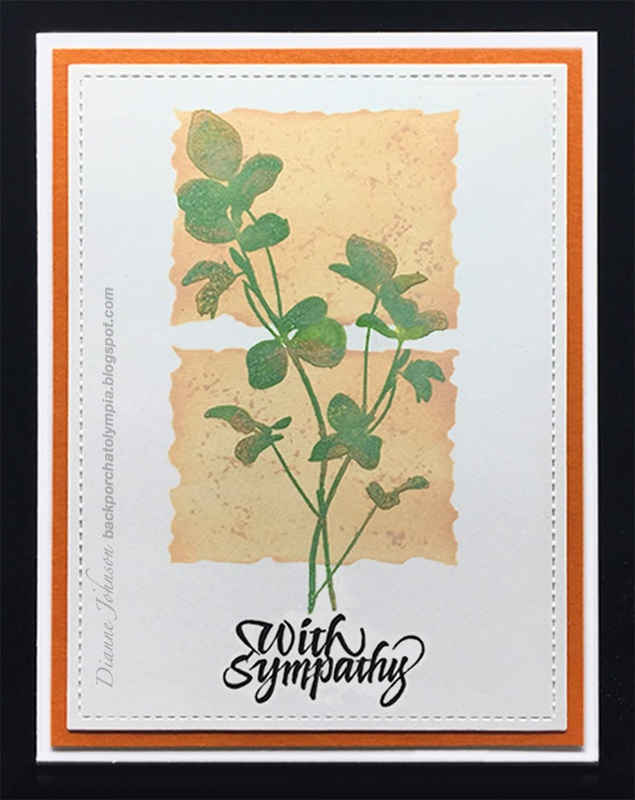 The April 2019 new collection of stamps and stencils is available at the Magenta store, and you can look at the collection here. 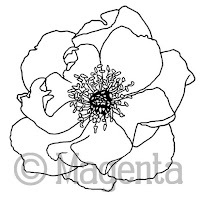 Click on "Rubberstamps" to see the new collection of stamps, and on "Templates and Masks" to see the new collection of stencils. I'm loving all of the new stamps, and the stencils are amazing! Today I'm using one of the new stamps, Bloom Crescent. I can really see that this stamp will be one of my all-time favorites. It's beautiful and would be amazing colored with color pencils, watercolors, Nuance, markers...really just anything. 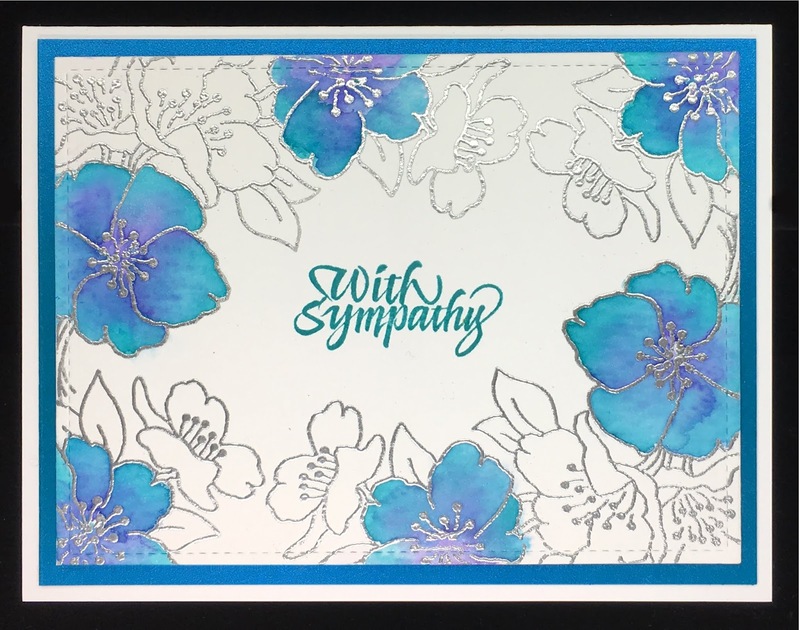 Due to a difficult first few months of this year, I am completely out of Sympathy cards. I need to make more, and this stamp lends itself well to that; but I also think it could be used for almost any occasion. Since this is a Sympathy card, I wanted it to be simple but elegant. I colored part of the blossoms with Distress Ink used as watercolor. The image was partially stamped four times with Versamark and embossed with silver embossing powder. The sentiment, which is one of Sally Penley's beautiful designs, was stamped with Distress Ink to match the blossoms. it was hard to photograph it so you could see the beautiful shine of the silver embossing. It's very pretty in real life. 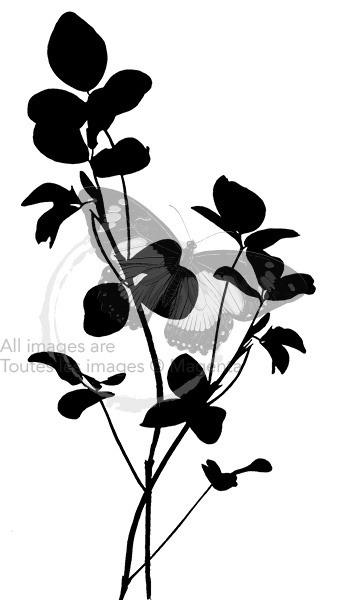 Part of the blooms are not colored to represent loss. My apologies for not posting as often as I used to. We are super busy with our family right now, including our wonderful new grandson. Our daughter, her husband and their son will be permanently moving to Iceland in July, and I am trying to spend as much time as I can with them before they leave. 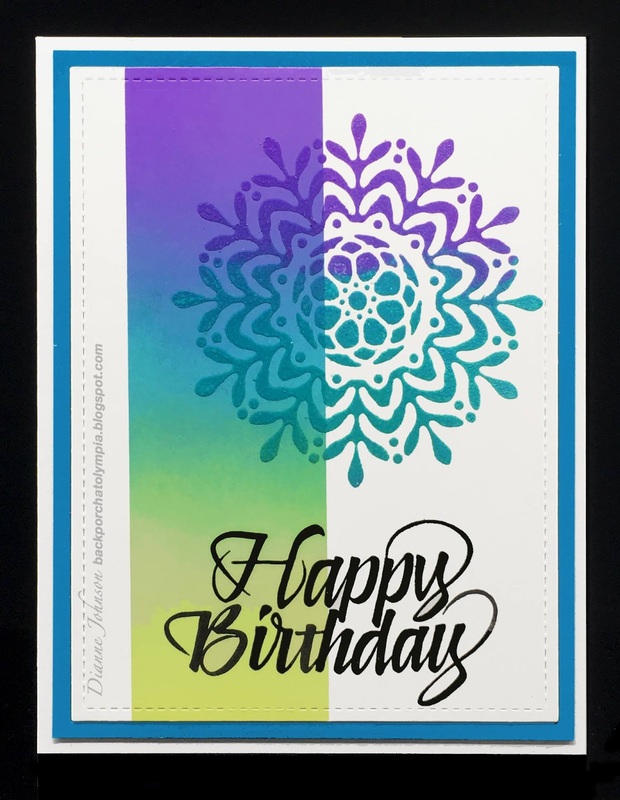 My hands are itching to use more of these gorgeous new stamps and stencils from Magenta though, and I hope to be able to do so in the near future. 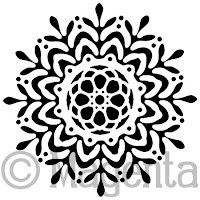 Hi I'm over at the Magenta blog today, and you can see my post here. For some time I have been wanting to play with the cool deckle edged rectangle and square stencils designed by Nathalie Métivier. I liked this one so much I intend to use more of them in the near future. I taped my panel (cut to 3.75" x 5" using Lawn Fawn LF768 die) to the Magenta stencil TM276, positioning it so that I would use only 2 of the 3 rectangles on the stencil. I masked the edges off with post-it tape. I used a makeup brush to add Tea Dye Distress Oxide, brushing from the sides toward the center of each rectangle. I stamped the dotted texture stamp inside the shaded area, and then inked the Clover Silhouette stamp (designed by Magenta DT member Ellie Knol) up with Mowed Lawn Distress Oxide and stamped it. 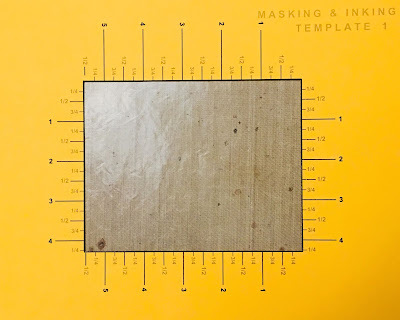 Since I was using a MISTI stamp platform, I was able to add some Dried Marigold Distress Oxide ink in a few places on the stamp and stamp it again. I added the Sympathy sentiment last. 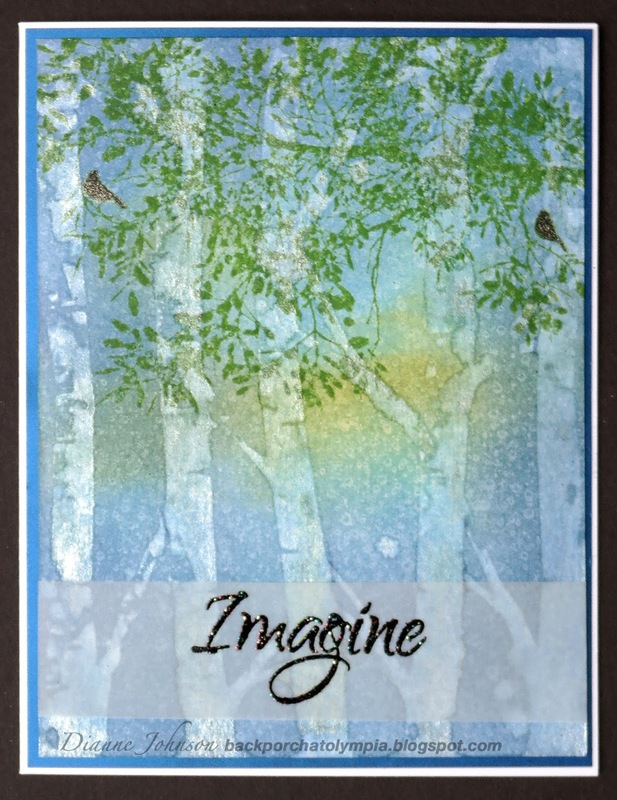 This is one of Sally Penley's beautiful calligraphy stamps, and I stamped it with Versafine Onyx Black ink. These are the brushes I used, and I really like them. I know that Picket Fence sells a set like this but I got mine on Amazon. They're really soft, and I didn't think that the color would be that intense, but it surprised me. I felt like I barely brushed it on, and the shading has such a smooth appearance. 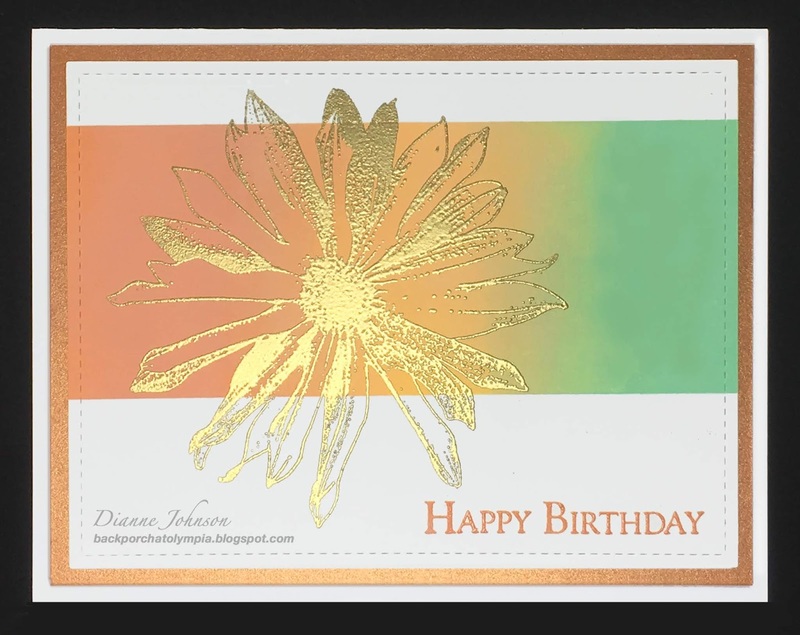 For this card I did shading, but I also plan to use them to do some blending inside of some of Nathalie's square and rectangular stencils and I'll share those in the future. 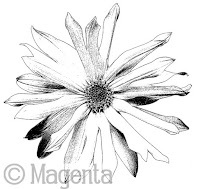 Hi everyone, I'm over at the Magenta Blog today, and you can see that post here. I have six cards for you! I've been having a lot of fun doing Distress Oxide blends. The combinations are endless, and once you start it's hard to stop! I was inspired by Kristina Werner to play with Oxide blending. She has been doing different Oxide blends every Friday for over a month now, and her videos are mesmerizing. You can see the first one here, and they are all worth looking at. Although I have not used her specific color combinations, I really do like how they all turned out, and won't hesitate to use her examples for future blends. Instead of blending the entire card, I did masked blending, where I mask off a strip to make a place to blend the inks. 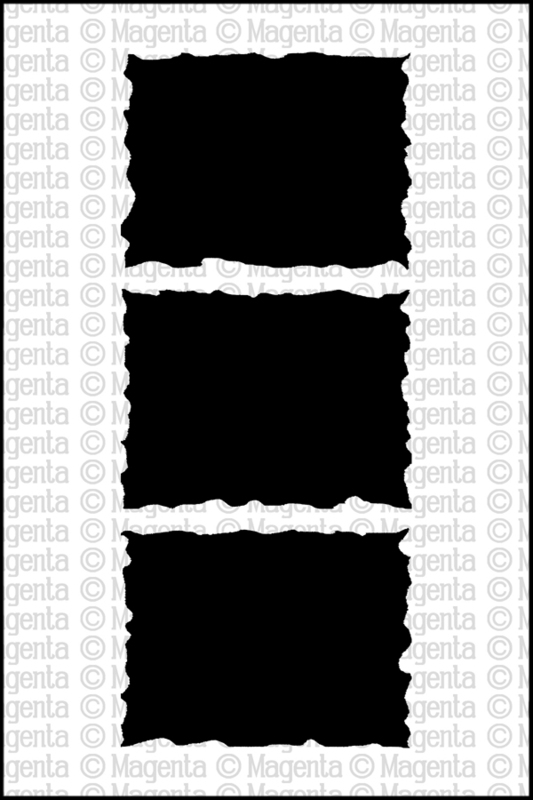 The strip you use can be horizontal or vertical, and can be of any width you prefer. With all the backgrounds I did, I made six cards, and still have 4 backgrounds to use for future cards. The blending is easy and fun, and then you can just choose a beautiful stamp and a sentiment and you're done! Can you tell that the Wilted Violet; Peacock Feathers, Twisted Citron combination is my favorite? All of the color combinations are listed in the details below. I want to show you something my hubby made for me to use to help with masked blending, and I think it would not be too hard for you to make also. I sometimes have trouble making my masked off areas straight and parallel, and making them the width I want. Measuring carefully is not one of my best talents. 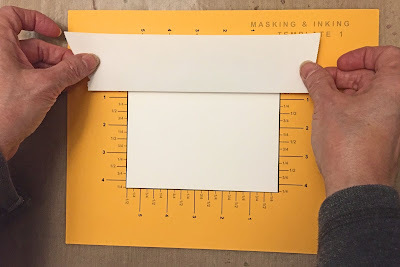 To make your own template like this one, take a piece of cardstock (I used 80# so it would go through the printer) and measure out a rectangle 4.25" x 5.5" in the center. This is the size of the cards I make, but you could make yours whatever size you prefer. Then put a tick mark every 1/4" along all 4 sides. 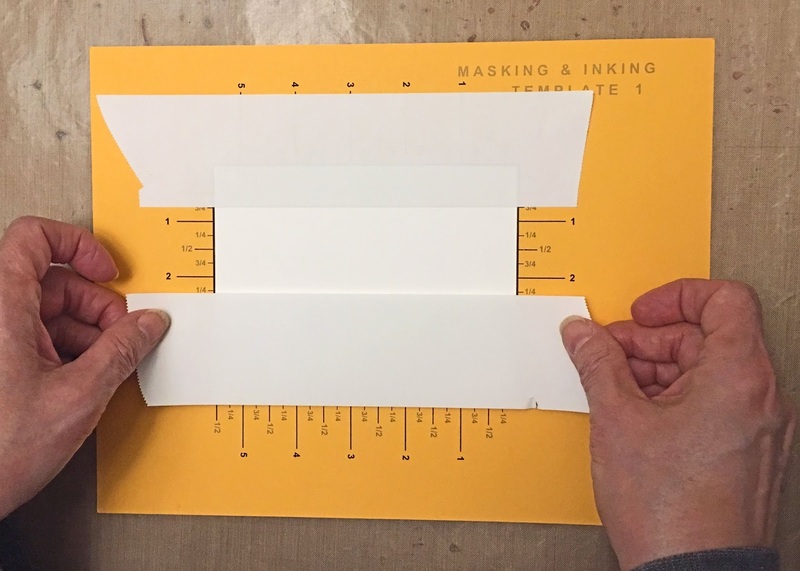 My hubby did mine in photoshop, but you could easily just do it by hand with a ruler or a T-square. 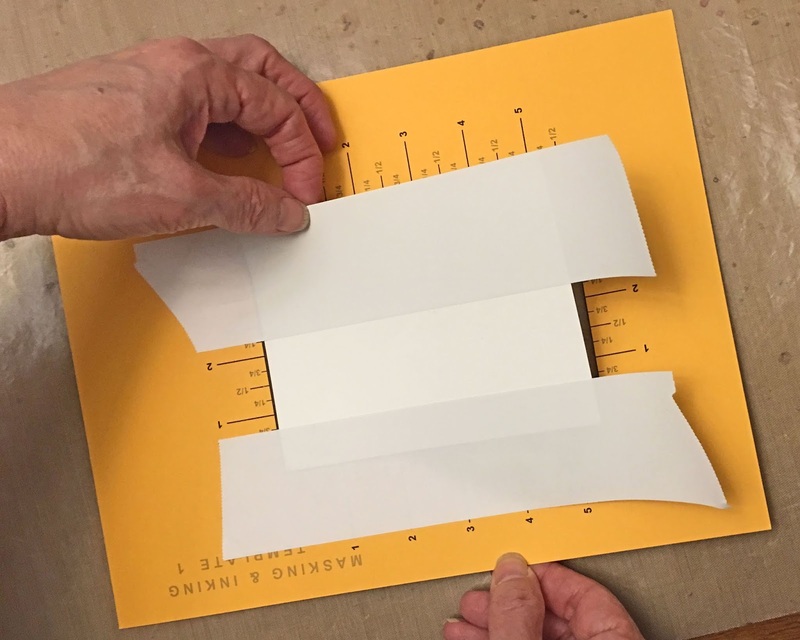 You'll want to cut out the center rectangle, using a craft knife or use a paper cutter if you have the type of cutter that can make these partial cuts. 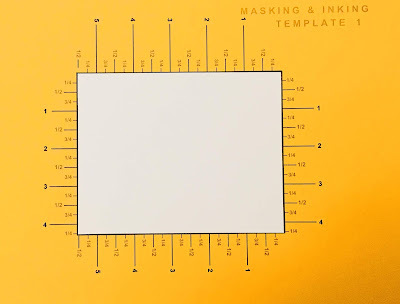 The reason I wanted this template is so it would be easier to position my panel so that it would not move while I'm masking it. 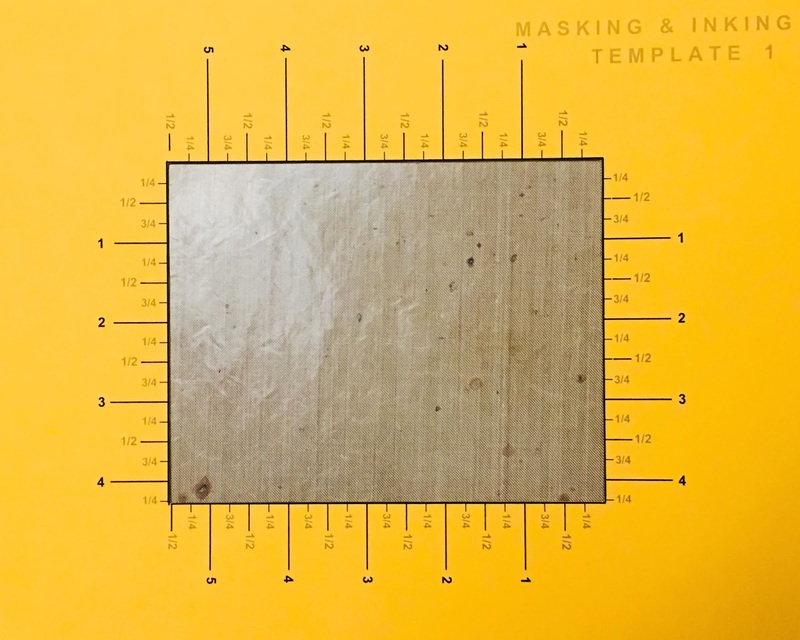 It's not as easy as it looks to get masks straight and parallel. Keep reading to see how this works. I placed my 4.25" x 5" card panel into the center opening. This prevents the panel from moving while I mask it. You can see that with measurements on all 4 sides, you can mask it off in either the vertical or horizontal direction. For masking, I used Post-it Removable Labeling Tape 695, and tore off pieces that would span the center panel horizontally. I chose 3/4" from the top of the panel for the first mask. I chose 2.25" for the second mask, so that makes the center opening 1.5" wide. On another later panel, I chose a 2" opening. You can make the opening any size for the card you are planning. 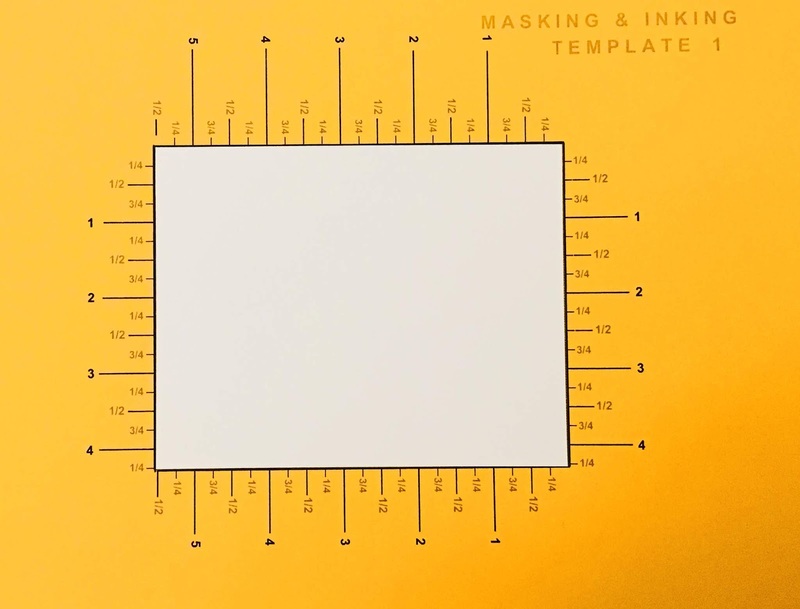 Since I don't want to ink up my template, and I prefer to do ink blending on a craft mat, I just removed my masked off card panel. The masks stayed in place very well. 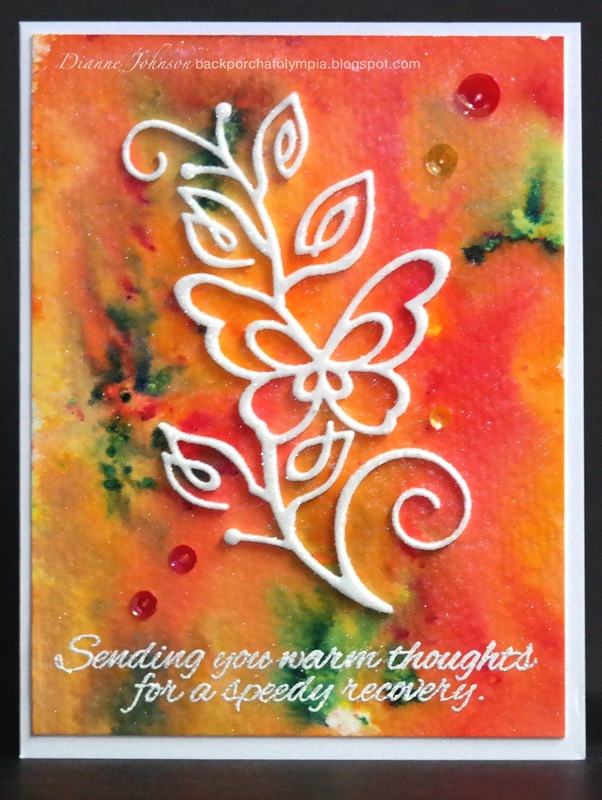 I placed the panel on my craft mat and chose 3 colors of Distress Oxide to blend. One of the tips from Kristina Werner is to blend these inks with a back and forth motion, rather than using little circular motions like you do with regular Distress. I found this to be a good tip. 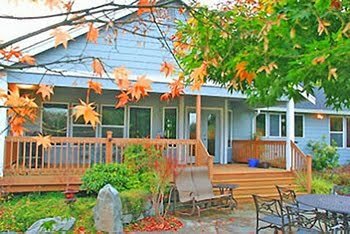 You will also have to alternate the colors several times to get a good blend, and to insure that one color does not overpower another. My favorite part is removing the mask. 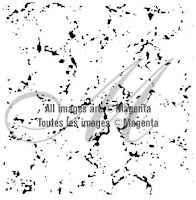 You can use regular Distress ink to do blends like this also. I do find however, that the Oxide Distress inks blend much easier and more smoothly. This is because the Oxides are a hybrid of dye and pigment inks. 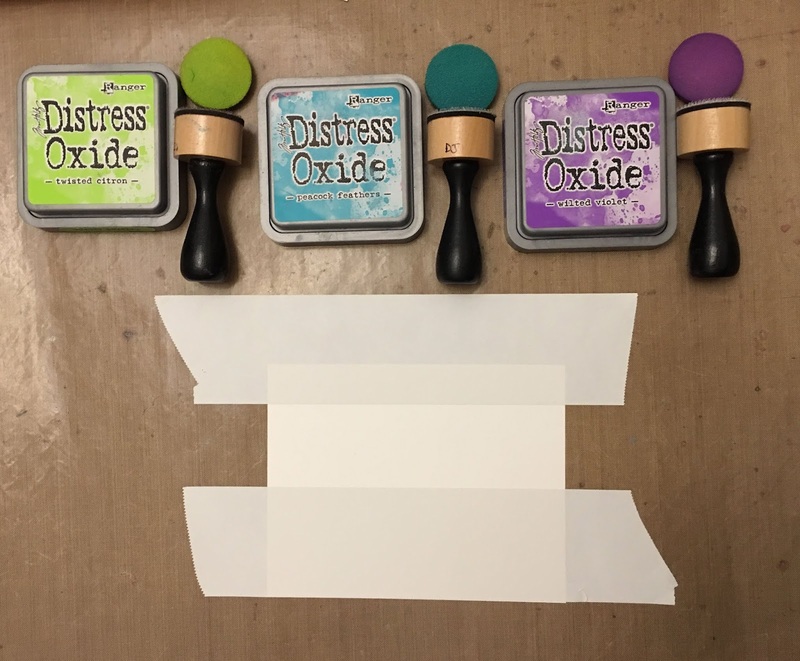 The regular Distress inks are dye only, and that ink sinks right into the cardstock. The pigment portion of the Oxides stay on top for awhile, so the blending is easier. I turned each mask upside down and used them each twice. These were so fun and easy to make! I hope you'll try them. 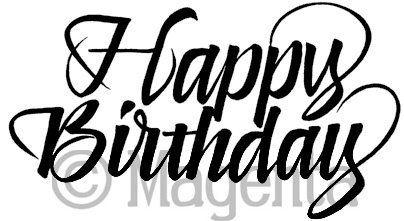 I found the card below to be a more somber combination, and decided not to make it a birthday card. It looks like Fall to me, or maybe sunset. (Aged Mahogany, Abandoned Coral, Scattered Straw). This one is going straight out to a good friend. 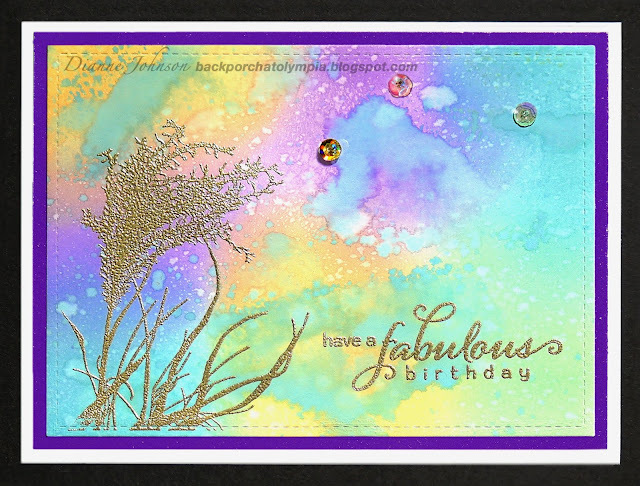 This is the second post showing cards I made using a new die set I acquired, Tim Holtz Multi-Media #5 dies by Sizzix (662688). I used two of the dies in the set. 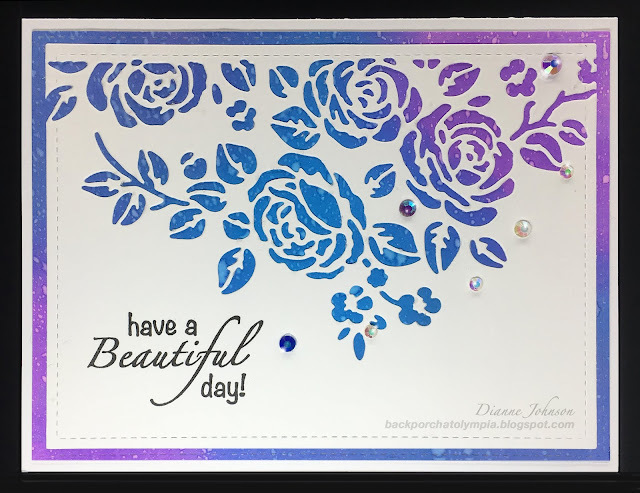 Dies like this make fast and easy cards if you're like me and love making lots of different backgrounds that you keep in your stash. This second die looks more like a cherry blossom branch, and not only is it a lovely die, it shows the colors of the panel behind it very nicely. I made 5 more cards - 4 Birthday cards and 1 Thank You card thrown in. These are the panels I used for this set of cards. Some of them look familiar because they are like other background panels that I used in Part 1 of this 2-part series. Please go here for Part 1 of you did not see it. I give links to posts using the techniques for the different panels. All of the background panels above except one were made using stencil stamping. The top center panel was made using Nuance powdered color. The background panels were cut to 4" x 5.25", and the white die-cut panels were cut to 3.75" x 5", with a stitched edge, using Lawn Fawn LF768 Small Stitched Rectangle Stackables. Here are all of the die-cut panels on top of the backgrounds. I really think that almost any background would look great with these dies. The Thank You card happened because this is the perfect size stamp to stamp beside the die-cut image. I love how this stamp fits horizontally next to an image that takes up 2/3 of the rest of the panel. Here are 4 of the finished cards. One had already been sent away before I photographed all of them together. I will be using these dies a lot in the future! I can quickly make a whole set of cards for a gift. 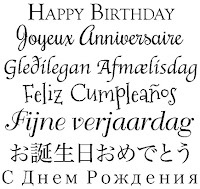 07.969.F have a Beautiful day! This post will partly be a walk down memory lane, and I have provided some examples of previous cards, plus some links to past posts using the featured techniques. 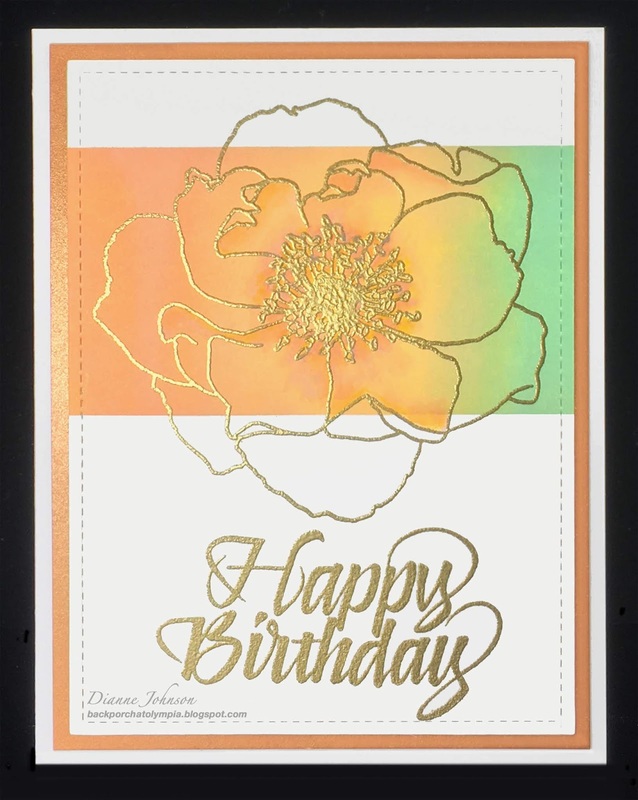 I still need to replenish my supply of Birthday cards; I have so many friends and relatives that I want to send a card to on their special day. 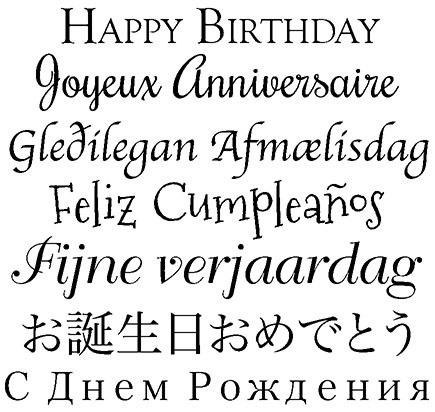 You will see a lot of Birthday sentiments on my cards for a while now. 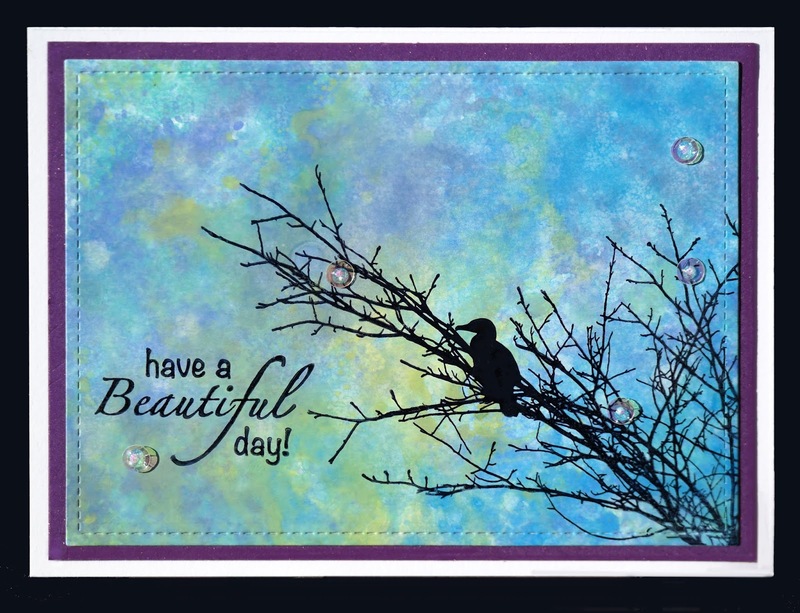 I think that a sentiment like "Have a Beautiful Day can work for a Birthday card, or for lots of special occasions, or even just saying Thinking of You. 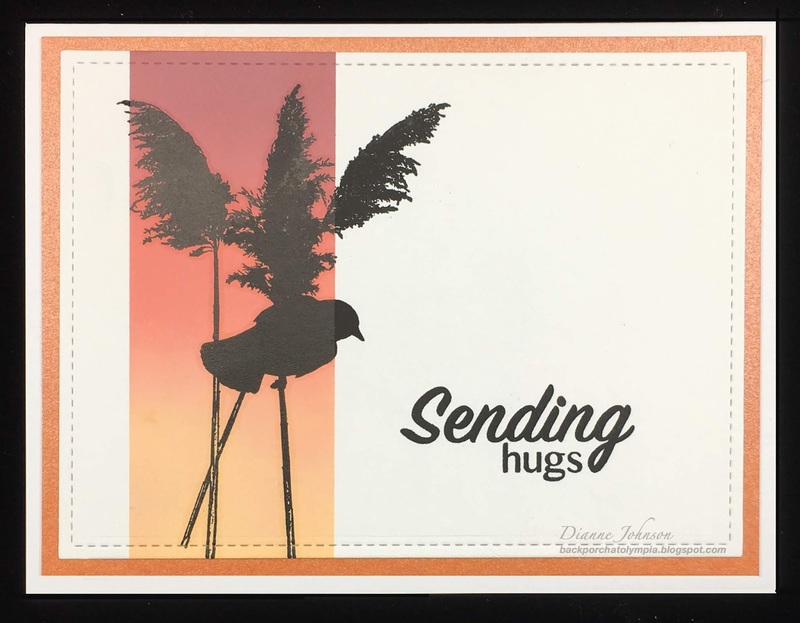 I recently acquired this great set of Tim Holtz Multi-Media #5 dies by Sizzix (662688). I like to make pretty backgrounds, so I love dies like this. If you have lots of nice backgrounds, putting the card together is pretty simple. There are three dies in this set. I cut the background panels to 5.25" x 4", and the white panel that I die-cut was cut to 5" x 3.75" using the largest size die in the Lawn Fawn LF768 Small Stitched Rectangle Stackables. The sentiment is from Magenta, and was stamped using Versafine Onyx Black ink. I started with some backgrounds that I had previously made while playing with various techniques. 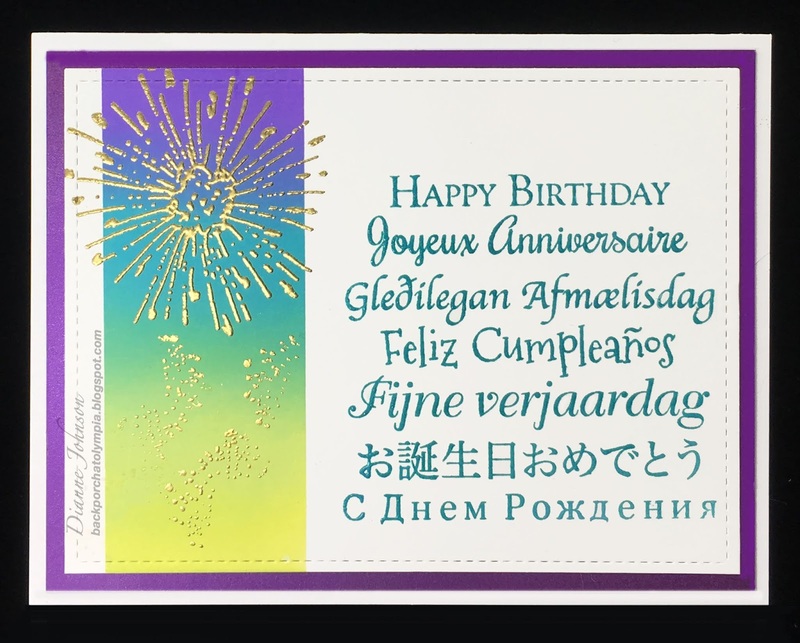 The top left and bottom right backgrounds shown above were made by "stencil stamping." 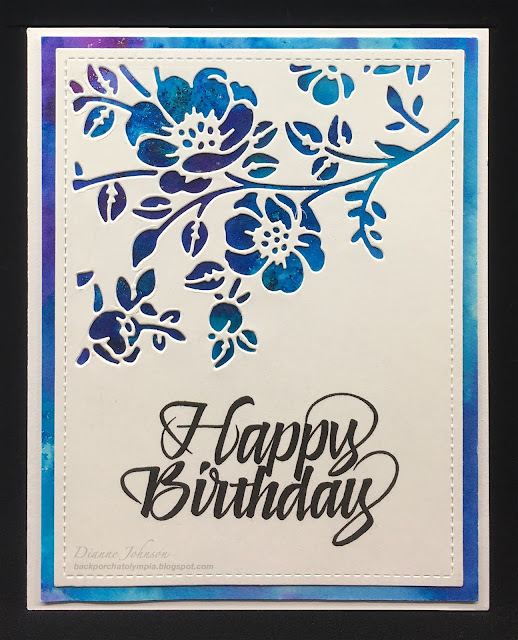 I have several posts on this technique, here, here (please scroll down for the stencil stamped cards), here, here, here, and here. This has been a favorite technique for a long time, and I used to really enjoy demo'ing it when I worked at Art 'n Soul. 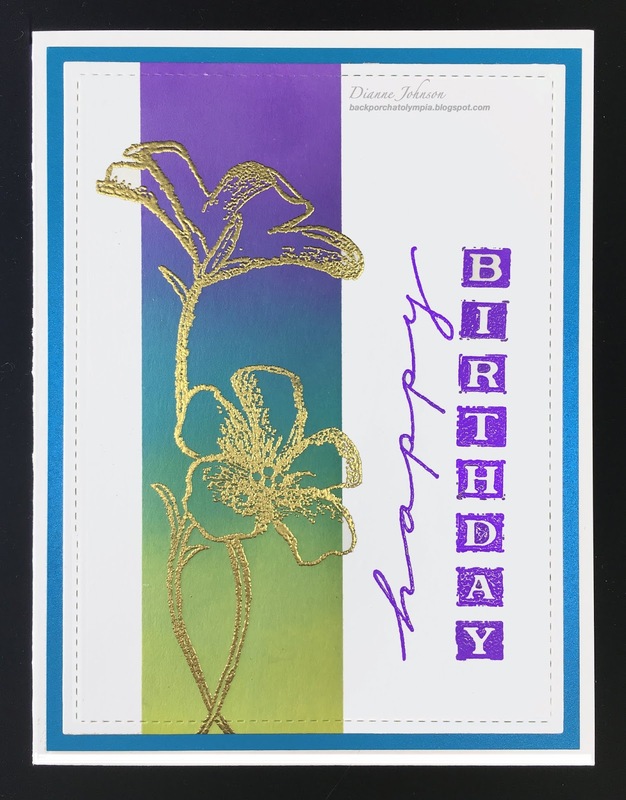 Here is an example of a previous card using stencil stamping. The bottom left panel is just blended Distress Oxide ink with some splatters of water thrown on it. 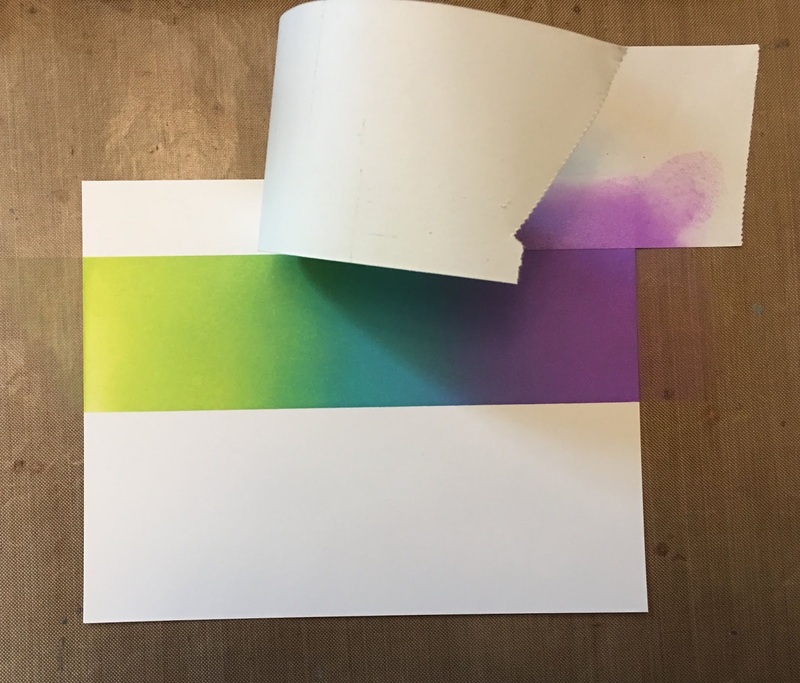 If you want to see my Distress Oxide overview post, packed with lots of information about using Distress Oxide inks, please go here. I also have fun techniques with Oxide inks here, here, here and here. The panel in the upper left of the photo showing the different backgrounds was done with one of the most popular techniques I have ever shown on my blog. It's a technique with Oxide inks, using Distress glaze over the Oxide. For a tutorial on how to do this technique, please go here. For some other posts with cards using this technique, go here, here and here. The final panel above, that is already covered with a die-cut (the orange one) was made using Nuance. Nuance is a fabulous powdered color from Magenta, and is lots of fun to use. If you search for Nuance on my blog, you will see lots of posts for many techniques using it. Here is a card using Nuance. Here's a look at all of the finished cards I made from this one die, and all of the beautiful backgrounds I chose out from my stash. I will have a second post using another die from this set soon. refer to the original posts for those techniques. Giant Used Craft Supplies Sale! Another Technique Tuesday Monkey Business Project!